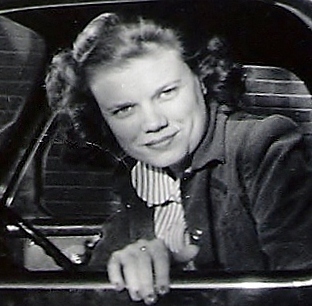 Our Mama, Jane, about 1953, five years after they married. Daddy took the photo. In 1973, when my mother, Jane, died at 50 of pancreatic cancer, everyone agreed it was much too soon for one so vibrant, so giving, so clearly an instrument of the God she served to leave the earth. It’s a long story, but she died only two-and-a-half months after our family had relocated to a new town in a new State, Fort Valley, GA, and even so, the First Methodist Church was filled to capacity at her funeral with those whose lives she had already touched in such a short time. Further, as testament to her long years of generous service to others, her obituary took up a full column in the Alabama Methodist Christian Advocate and both the Rev. C. Everett Barnes, Head of the Council on Ministries of the South Alabama/West Florida Conference of the Methodist Church, and the Rev. Edwin Kimbrough, Senior Pastor of First UMC Birmingham, the largest Methodist Church (at the time) in the North Alabama Conference, had traveled for over five hours from both ends of the State to jointly officiate. 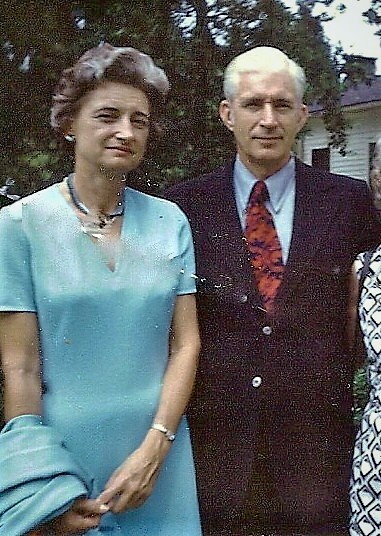 Betty and Daddy shortly after they married and she began buying his ties, which she always insisted be Countess Mara. So it is no wonder that I was very confused by her death. How could it be that God would find it necessary to remove one so young, so marvelous, as Mama; to elevate her to the next plane when there was still so much for her to do on this one? How could there possibly be any sense in that? What on earth was He up to? Well, the Holy Spirit is a mysterious loveliness, and, dear readers, while we may not understand every move She makes, if we can just be patient, things do eventually make sense. I will always, of course, believe that Mama died too young, because she did, but looking back now, through the long lens of time, I can also discern the blessings that grew out of our sorrow, and at the top of that list would be my second mother, Betty Gates Wilson. I say “second mother” because, when I was 40, Miriam 37 and Mary 28, she adopted the three of us out of love both for us and our father, and so she literally was, from that time until her death a quarter-century later, our mom. 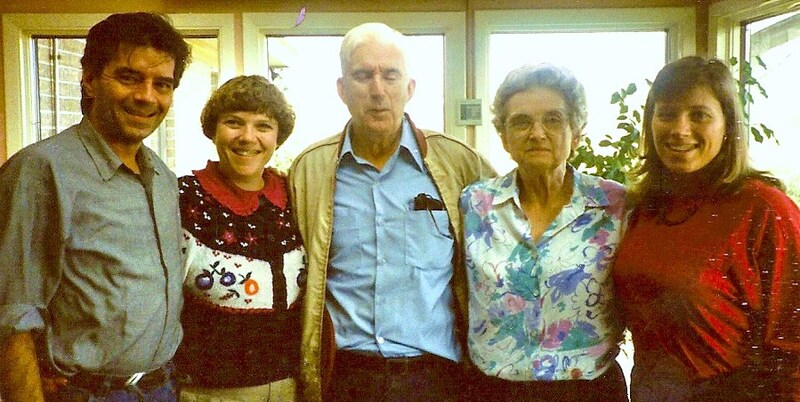 Me, Miriam, Daddy, Betty and Mary at the time of our adoption in 1990. I’ve been thinking of her a lot lately because the Bradford Pears have finally bloomed in New York City. I’m sure they came and went in the south in early March, as they are wont to do, but up here, they have only now appeared. 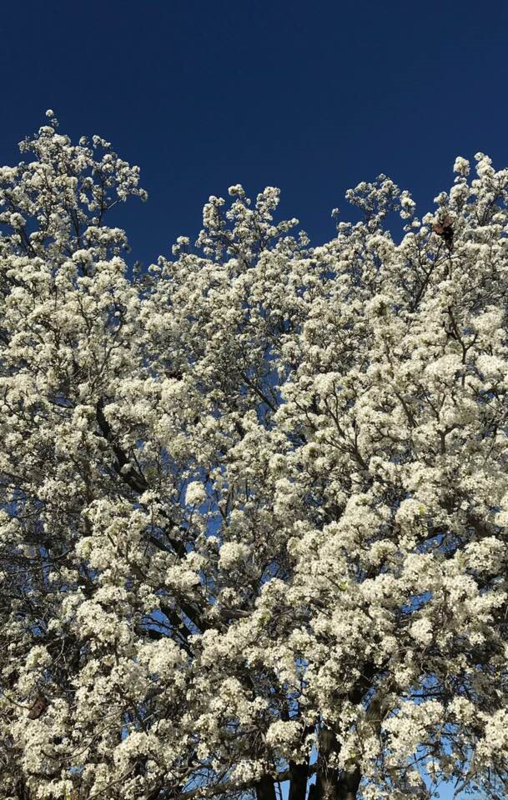 If you don’t know what a Bradford pear tree is, they are prized all across the country for their dense white blooms that appear in the early spring and turn the trees into gigantic balls of cotton. You have certainly seen them, since they seem to be everywhere these days. They were all the rage, and something relatively new, when Betty built her Fort Valley dream house in about 1982, and she planted a grove of them in the front yard where, for the next sixteen years, they were her pride and joy. Nothing made her happier than when, just as she had planned it, they flushed out each March with their display of bright white set against the dark caramel-colored brick of her house. And so, it was perhaps only right that they were at their absolute densest bloom on the night that she died. Richard and I had been vacationing in Costa Rica, but, due to her failing health after years battling emphysema, had rescheduled our return trip to go to Georgia rather than New York, and arrived after dark on a Friday. She had known for several days when we would be arriving, and Daddy told us that all week long, as each morning arrived, she had asked him, “Is it Friday today?” and every day, when he said, “Not yet,” would look crestfallen and just a trifle annoyed as she continued pushing those tortured breaths in and out and in and out. Clearly, she was determined to be there to greet us when we arrived, and by grace and her own stubbornness, when we drove up about four that afternoon, she was still very much herself, if a diminished version of the Betty we knew. We visited for a short while and then she rested for a bit while I helped get supper ready, then we gathered around her bed to eat while we showed her the photos we had “rush” developed so she could share in our trip with us. I also told her that her trees, which she couldn’t see from the bedroom at the back of the house, were blooming like crazy, and that brought a huge smile to her face. It was a lovely, touching, loving reunion, even though we were all aware we were nearing the end, and at four a.m. that morning during a tumultuous Georgia thunderstorm, she died. The next night, after the miraculous women of the “Fort Valley Funeral Brigade,” as I lovingly called them, had cleaned up the mess and headed home (the same four wonderful women who had been in our kitchen to feed 95 out-of-towner family and friends when Mama had died fully a quarter-century earlier! ), I curled up in Betty’s easy chair and wrote a few lines about those pear trees that would find their way onto the back of the program for her funeral service the next day. And clouds began to form above as day moved into night. So I settled for effusiveness when I began to speak. Then said it yet again, after a pause to gather breath. Our Betty climbed aboard, at last relieved of respirations. Her trees stood bright just like the light that ever shone about her. May every blooming pear tree be a tribute to her life.